Recent release “The Gospel Train- Glory!” from Page Publishing author Larry Barnum is a collection of sermon-like essays celebrating the gift and lifelong journey of faith. Larry Barnum, an explorer, adventurer, discoverer, archaeologist, and evangelist who has served in ministry both in and outside of church for twenty-five years, has completed his book “The Gospel Train- Glory!”: an inspiring Scripture-based work. Larry shares, “We are taking a very powerful, very expensive, yet very scenic revival train trip with the Holy Ghost as our conductor. As the master of this area, He knows all the attractions and will make stops often to point out the details. You will see the dazzling merchant man in all his finery, who finds a Pearl of Great Price, then sells everything he has to buy that one pearl. You will see as you come out of mountains pass at night, a city on a hill that cannot be hid. We’re off. Published by New York City-based Page Publishing, Larry Barnum’s book is a thought-provoking work offered to encourage and inspire readers on their own faith journeys. 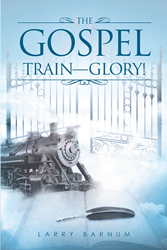 Readers who wish to experience this evangelical work can purchase “The Gospel Train- Glory!” at bookstores everywhere, or online at the Apple iTunes store, Amazon, Google Play, or Barnes and Noble.